At Air Navigation Pro, we are all pilots and we know what our users need when they fly. We are constantly innovating to propose to our user the best in class Aviation application so they can enjoy their flight the best way possible and rely on a solid flight planning app that will provide them with useful and efficient tools. If you are new here, you might want to read first our previous article regarding the version 6.1 of Air Navigation Pro iOS. This new feature allow you to see either the elevation profile of your planned route, or the elevation cut of what is in front of you. Switch between those two modes by typing on the elevation graph. The vertical navigation feature in our flight planning app now allows you to plot a route in the profile view. By tapping the title on the elevation graph to view the planned flight or what is in front of the aircraft, you can identify and pre-plan around complicated airspace and terrain—the vertical profile that will keep you clear of trouble will be easy to see before you ever leave the ground. When you are in edit mode, you can tap the elevation graph title to view the planned route and scroll through the route by swiping left and right on the elevation graph. Once in flight, tap the elevation graph title again to see what is in front of you in case you just want to get around a big cloud and make sure of the elevation profile in front of you. This makes situational awareness a breeze when you use Air Navigation Pro. Use the intuitive drag and drop technique to easily select a new altitude for any leg along your route. Otherwise, select the route icon, then allow editing with the lock feature at the top of the screen. Now, tap the PLN altitude field for the waypoint where you want to change altitude. Enter a new altitude and check the box for reach before waypoint or reach after waypoint. If reach after waypoint is selected, the new altitude will be separated from the initial altitude by a forward slash (“/”) on the route page. A revised profile reflecting the altitude changes is now visible on the elevation display. This makes planning terrain clearance, crossing restrictions and avoiding complicated airspace easier than ever! Staying clear of dangerous terrain is now even easier than ever with Air Navigation Pro’s flight planning app. When viewing the elevation graph and moving map, you can now set a corridor width on your display. The flight planning app will automatically compute the MSA (Minimum Safe Altitude) within the corridor and display the MSA in the upper right hand corner of the elevation display. For instance, if you set the corridor width to 3 NM, Air Navigation Pro will search for the highest MSA within 1.5 NM on either side of the corridor centerline. 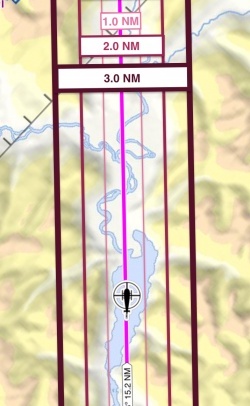 Not only is the MSA that is computed by Air Navigation Pro for that corridor is depicted on the elevation graph, but terrain within the selected corridor is displayed in a different color for easy threat analysis. Flight navigation is all about situational awareness: Try this feature to enhance your level of safety next time you go out to fly. To set the corridor width, access settings on the route summary page. It is important to bear in mind that TAS changes as MSA changes with the corridor selection. One useful feature of the route corridor option is that you can not only select a good obstacle avoidance altitude, but you can also anticipate that altitude’s effect on your performance. 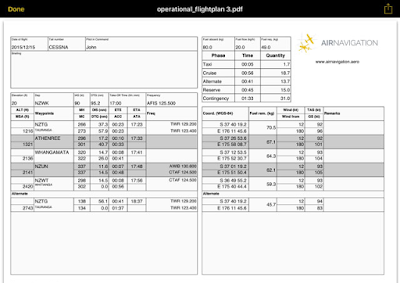 This makes your flight planning more accurate than ever! If you have purchased the 3D view data package from the Air Navigation Pro Map Store, you can now view satellite imagery on the moving map display. Simply select the map icon from the menu, then select maps. From there, you can slide satellite photos on. This feature is great for VFR pilots or for identifying items normally left off of conventional aeronautical charts. Have you made notes about an airport or waypoint that you want to share with another pilot? How about transferring user documents from your iPad to your iPhone? This is now simple with Air Navigation Pro VFR flight planning! Simply touch the waypoint or airport on your map view and hit the airdrop symbol in the upper right hand corner. This makes it easy to share information with other iOS devices. There are other ways to send important information too: not only can you use the airdrop feature, but you can send through iOS Message, Mail, Notes or even to a Dropbox account. To send files in these ways, just select more from the sharing menu. Important note: If a file does not display once it is sent, just hit the refresh button. 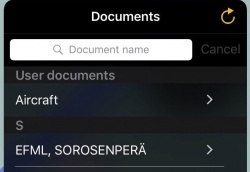 This will re-index the documents and the sent file will appear. If you have documents that you have saved that you no longer need, this update has made it easy to declutter your stash. Access your documents through configuration, then select the information icon. By scrolling to the bottom, you can find the button to delete the document. If you have Air Navigation Pro, you already know that preflight briefings are available for selected airports and routes. Now, the NOTAM radiuses can be hidden on your map screen. This will declutter the map and make your job of navigating easier. Just select preflight briefings from the configuration menu to hide NOTAM radiuses. Unwanted Built In Waypoints? Hide them! The ability to declutter the map is further enhanced with this update to Air Navigation Pro. You can now hide built in waypoints that you don’t want to see by accessing the waypoints menu under map settings. Deselect the built in waypoints by scrolling to the bottom of the waypoints menu and sliding show built in waypoints to off. Remember, individual types of displayed waypoints can still be managed from the waypoints menu—simply uncheck any waypoint types you don’t want to see. It is important to note that hidden waypoints can still be selected on the moving map at any time. This is especially useful when you are using a background chart (like an approach plate) and want to pull up details about a NAVAID or airport, If any of these waypoints have been deselected on the waypoints menu, they will need to be re-selected to be viewable on the map in order to access the waypoint information. Along with the ability to set the width of the route corridor, we have added new adjustable flight plan parameters to enhance accuracy and safety. These parameters include accounting for climb and descent in the time estimate, an option to round the flight time up (adds an extra cushion for safety), the ability to show the estimated date and time of arrival, and a feature that incorporates holding time into your planning. The holding time entry in the flight plan allows you to plan for known traffic delays or to determine when you need to leave the holding fix for an alternate once you are in flight. This new holding time parameter is especially useful for Air Navigation Pro’s helicopter operators. —no more guessing how much time you can spend overhead! The app does the head work for you so that you can concentrate on flying. 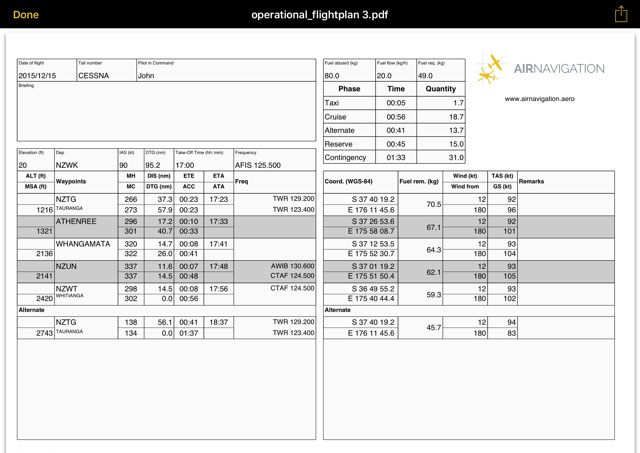 These flight plan parameters can be adjusted before takeoff or in flight from the route instrument. Just select the map icon at the top of the page. Logging your iOS device into your Air Navigation Pro account is easier than ever with our new “Log in via QR code” feature. Simply log on via your computer at services.xample.ch, then go to “Log on iPad/iPhone.” Now go to Air Navigation Services on your device, select Air Navigation Log In and then Login Via QR Code. Now just point your QR app enabled camera at the screen and shoot! Logging in from a new device has never been easier. This update to our flight navigation app also features changes to the custom waypoints editor, route module, route page, aircraft and elevation graph. Additionally, Air Navigation Pro now has a “take me home feature;” to designate a home airport, select the route icon, then the “I” symbol next to take me home. Once this is done, the flight plan app will plot a course for home with a simple screen press. We are adding new maps to the map store and to features to Air Navigation Services all the time. 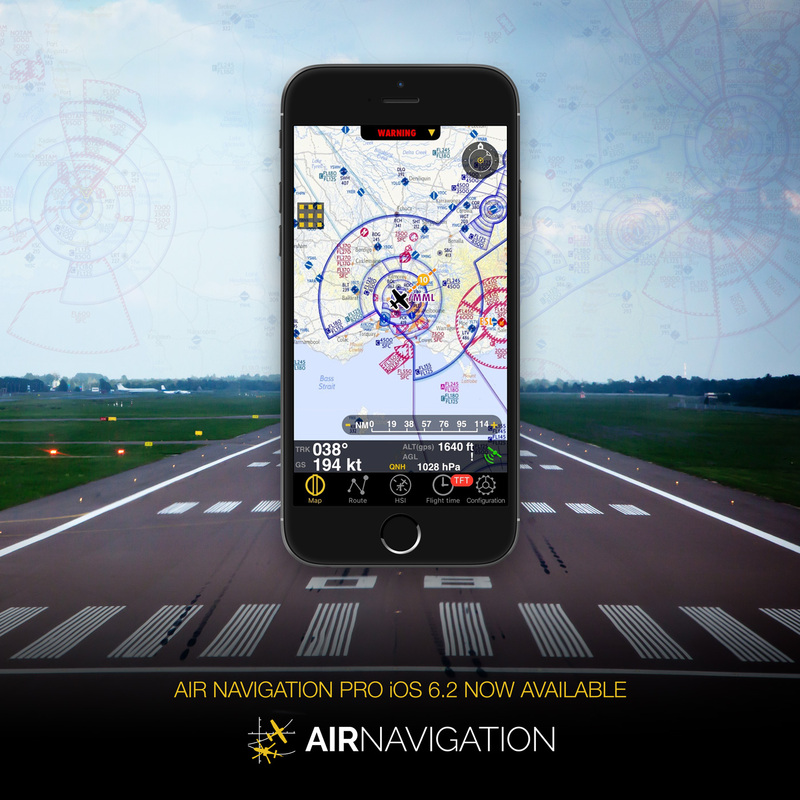 Check out the new stuff and find out why Air Navigation Pro is the best flight plan app around! Android users—stay tuned for improvements to our Android aviation flight planning app, coming soon! Thanks for nice information we are also same in this field and welcome you to contact with us. Veo que habéis eliminado la actualización de espacios aéreos y puntos de referencia gratuita que teníais. Es cierto? O esta previsto que sea solo de pago? Gracias.